Yep, it’s Friday. I’m really excited to be home with my family this weekend to get some things done around the house, catch up on some stamping, and take the kids to a movie. So, today I thought it was Thursday…lol. Come on!! It has happened to all of us right? Which means I am late with posting my sample for Beate’s wsc #39. I think this may be my latest favorite color combo: Vanilla, Soft Sky, and Night of Navy. It is very elegant. I read in one of the wedding mags out their that this is a “hot” color combo for weddings. I see why. ACCESSORIES USED: Scallop Punch, 1/16″ Circle Punch, Paper-Piercing Tool (Mat Pack), Silver Brads, Iridescent Ice, the navy satin ribbon I got at my local craft store. I’ll share with you a pic of the craziness. I know this has happened to all of us when we are rushing around day to day trying to get everything done. Remember, it is cold here where I live. ME: Ethan! Run upstairs and change your clothes so we can run to the grocery store. 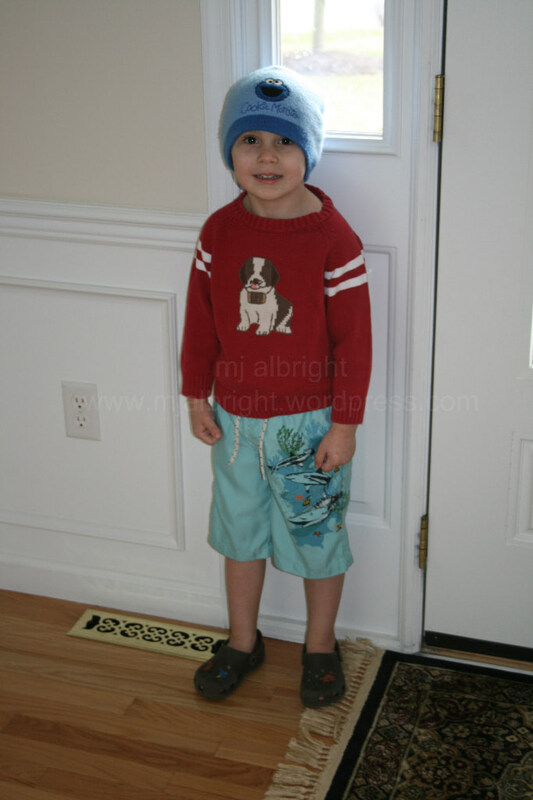 ETHAN: (standing at the front door) Mom, I’m ready. ME: Get upstairs right now. You are not wearing Crocs & Swimming Shorts! Oh the life of a 4 year old. Changing his clothes 10 times a day. Gotta love it. That is so like my 3 year old daughter!!! It will be so cold outside but she is dressed like she is at the beach! Love your work! I have been drawn to the “Kind Thoughts” stamp set time and again! I believe I will have to put that on my last minute SAB order tomorrow after seeing your card! Have a fabulous weekend! That is a great color combo.. may have to try one with some new stamps I am expecting! Love Ethan’s outfit! Just like my Josh.. always mismatched but too cute! Beautiful card, oh so elegant! ANd Blue is my favorite! Your Ethan story and picture cracked me up! You’re no fun at all…he might have wanted to stop for a swim on the way to the store! Beautiful card, MJ! Love it! And what a darling picture! I have a 4 year old, so I’m very familiar with those “moments”! Thanks for sharing! love your card Mary Jo…..I can totally relate to the wardrobe issue…My 4 year old daughter battles me daily on this…..she insists on wearing what she calls “up shirts” – translation: tank tops – in the dead of winter..it’s cold here in Delaware too!!! anyway, thanks for sharing…as always your work is awesome! Your card for the sketch is gorgeous and your child is too cute! OH I am busting a gut…..Hey, I took my 5 year old out in to trood through a pasture last week in Barbie flip flops – it was 29 degrees. She’s just fine. He will be, too! Love your gorgeous, gorgeous card! It’s just beautiful…I am going to try that combo – I’ve really been drawn back to more ivory lately. Have a wonderful weekend, sweet friend. Gorgeous card, MJ! I will have to try your color combo! It looks wonderful! Ethan made me smile! That’s so cute. Beautiful colors, MJ — one of my favorite combos, too! And oh, I can relate to that 4-yr old conversation! very pretty card, love the colors and your pretty butterfly! Your son cracks me up, he is ready for spring isn’t he! Gorgeous card and such a cute kid!!! lol he looks just like my daughter when she dresses herself. Pirate pants and a non matching t shirt, bball cap, some variety of shoes and a quilted vest! Beautiful card Mary jo, LOVE the pretty design and soft colors. cute pic and story! beautiful card!